Transforming Education with STEAM is a seminar offered by the Teaching Artist Institute (TAI), a collaborative project between the Maryland affiliate of Young Audiences, the Arts Education in Maryland Schools Alliance (AEMS), and the Maryland State Arts Council (MSAC). 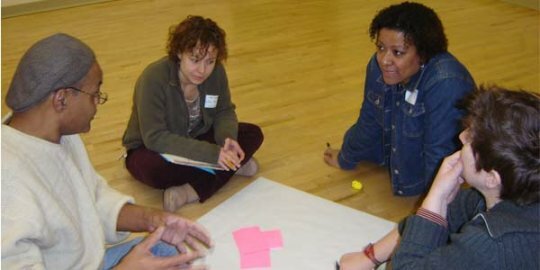 TAI brings artists and teachers together to rethink learning through arts integration. We believe we can create the best circumstances for learning by combining the educational expertise of teachers with the creativity of artists. This seminar is custom-designed for its participants who were selected from a competitive pool of applicants. This year's seminar boasted the largest TAI class ever, including 27 professional teaching artists and 10 staff members from seven Young Audiences affiliates. Participants had the option to focus on how to integrate the arts with STEM (Science, Technology, Engineering, and Mathematics) to create a STEAM residency program or creating a fine arts residency program. Each teaching artist participant is paired with a teacher partner to build and refine their residency program. Affiliate staff and teaching artists participated in the three-day retreat in September and receive one-on-one time with TAI staff. Affiliate staff experienced how TAI functioned and better understand how to work with roster artists to create STEAM and fine arts programs for schools in their respective communities. TAI was created to help artists deliver high-quality arts experiences to students which are standards-based and enhance learning in the arts and other content areas. TAI achieves this by offering in-depth training seminars for artists and opportunities for TAI artists to receive guidance and support as they develop new school programs through an artist/teacher matching program. Learn more about TAI on the Young Audiences Maryland website: http://yamd.org/programs/teaching-artist-institute.